Select persimmons that are heavy for their size and have glossy, firm and brightly colored orange skin. Avoid persimmons that are yellow or green in color. 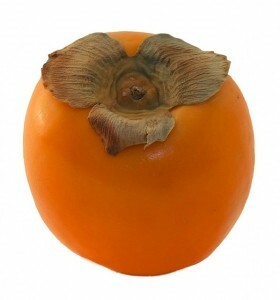 Hachiya persimmons frequently have black staining on the skin which is not an indication of a problem. Avoid bruised persimmons that will quickly spoil. Store persimmons at room temperature until ripe and then store them in a plastic bag in the refrigerator for a few days. Persimmons can be frozen whole or as a puree. To freeze whole simply wash the fruit under cool water, dry with a paper towel and place in a freezer container and store in the freezer. To freeze persimmon puree, wash, peel and puree the persimmons. Add 1/8 teaspoon of ascorbic acid to each quart of puree to prevent discoloration. Place the puree in freezer containers and store in the freezer. If you purchase persimmons that are not yet ripe place them in a brown paper bag with an apple or banana and fold the top closed. Check the persimmons for ripeness each day. The ethylene gas produced will speed up the ripening process of the persimmons.